Pioneer is a word that tends to be utilized rather loosely in the horse industry but there can be no denying that it is totally appropriate when assigned to Dr. Frank Gravlee, the founder of Life Data Labs. It all began with a galvanized tub and a canoe paddle. Cherokee, Alabama is difficult to find on the best of road maps. The closest community of any size is Florence (pop. 140,000) located on the bank of the Tennessee River. It’s not really famous for anything other than perhaps Life Data Labs. 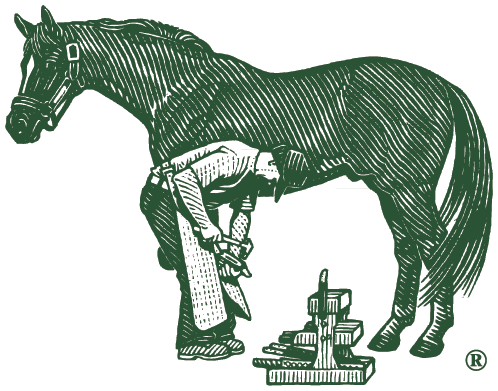 That name may not readily jump to mind for horse people but its principal product, Farrier’s Formula, certainly would. The familiar pelleted nutritional supplement has been on the commercial market for two decades and its followers swear by it although very few would know the story behind its creation. In meeting Dr. Gravlee the first image that comes to mind is of the late Colonel Saunders of Kentucky Fried Chicken fame. Clearly there is not even a remote connection but he exudes that gentlemanly southern charm of a bygone era. He has that knack of putting one instantly at ease starting with a powerful handshake that belies his 76 years. This interview took place at the company headquarters which is as modern as modern can be. It’s a far cry from Life Data’s origins. Rural Alabama is where Frank was raised on a farm which his father operated after serving as a farrier in the Calvary during World War I. Thus it comes as no surprise that horses and shoeing were integral parts of his life. This was a time when people depended on horses. They were an important part of their lives and by necessity they knew a great deal more about general horsemanship than today’s horse owners. “People like my father had to know how to deal with horse problems because there were not the number of veterinarians like today. In fact after World War II the general thought among school administrators was that many of the veterinary schools should be closed down because technology was taking over and what need would there be for veterinarians? Remember this was long before the pet industry took hold and horses were not yet being used for recreational purposes,” he points out. Born in 1931, young Frank was not old enough for the war effort and was left behind to help run the family farm. “I was pretty much on my own to maintain 200 acres but it was there I developed a love of farming. I set my sights on doing that after graduating high school. In 1949 I started on a degree in agricultural science. I hitchhiked to Auburn with one suitcase and $50 in my pocket,” he fondly recalls. It was not long thereafter he came to realize that no matter how much education he had, the farming opportunity would never come his way because of his lack of money. Interestingly, his university advisers did their best to steer him toward human medicine. “They really pressured me to go the human medicine route because they really believed that veterinarians were a thing of the past. Finally I said I would if they promised me that it would make me a better veterinarian. That settled the issue,” he remembers. For the next eight years he toiled in academia without any of the financial assistance students now have. No grant or loan money was available other than those on the GI bill (World War II vets) so he maintained part-time jobs throughout those years. In 1956, fresh out of school, graduation diploma in hand, 25 year-old Frank Gravlee set out to make his mark in veterinary medicine. He interned for three months in Little Rock, Arkansas with Dr. Ted Mason, one of the founders of the American Association of Equine Practitioners and his interest in horses was fuelled. "When I did graduate those vets I knew of were still carrying on so there wasn’t a practice for sale. I had no choice but to open my own which I did in Florence which back then had a population of only 25,000 or so. I dealt with large animals but truthfully would take whatever I could." His business started in an old shack that had been used by a local vendor to store crates. For the grand total of $25 a month he was given access to a building with the front porch caved in and newspapers stuffed in the walls to keep the wind out. The major component of the new veterinarian’s business was testing cattle for Brucellosis for the government. It was not as easy as it sounds but it did provide for many stories that Dr. Gravlee cherishes today. “You had to be 90 per cent cowboy back in those days because you were left to wrestle and rope these animals yourself. Through that people got to know me because I was not from the area and that led to getting business but there wasn’t a lot of money around. There were more than a few times that I got paid with produce or maybe the odd bottle of white lightning,” he chuckles. If Dr. Gravlee paints a rather nostalgic notion of the veterinary trade that’s because it was at that time. During the first 10 years of his practice, horses made up only 10 per cent of the business. By the time he retired from it, that component had grown to 70 per cent. It was during this time he saw first hand problems with horses he could not explain from a disease standpoint which he had been taught. Gradually, he came to the conclusion that these had to be nutrition related which was very avant garde thinking at that time. This revelation haunted him to the point that in 1965, at the age of 34, he made the decision to return to school. This was a major decision because by then he was married with three children. What he did was return to graduate school at the renowned MIT, taking a three year residency in nutritional pathology graduating with a masters degree in nutritional biochemistry and intermediary metabolism. It still wasn’t quite what he was after. He spent a total of seven years in a semi-commercial chemical laboratory doing research but on people-related projects. He reflects that it also evolved into more administrative work than actual research and left him frustrated. I decided that the only answer was to go back into veterinary practice in Florence and through that avenue set about developing a nutritional source for horses. It was shortly thereafter that fate intervened with a client who had Thoroughbred horses and an abiding interest in nutrition. Frank profiled each horse and set about making the dietary supplement that was needed. In 1983 Farrier’s Formula first saw the light of day. Actually that’s not entirely true because it was originally called Hoof And Hair. Like so many small businesses, Life Data Labs was anything but flush with cash. The name Life Data Labs came courtesy of Frank’s oldest son who is an ophthalmologist. He focused on the obsession with data his father had and his goal to make life better for horses. By 1984 Frank had decided to give his veterinary practice to his son Scott, who had just finished veterinary school, and focus solely on developing Farrier’s Formula. He worked out a portion of the Florence veterinary office until 1986 when he relocated to the present site near Cherokee. He gradually developed a network of farriers, tack shops and veterinarians to distribute the product. Growth was slow but steady. He proudly proclaims that the company has shown growth every year since day one with the exception of one when production remained unchanged. Today, it is a multi-million dollar operation with an enviable base. “Throughout most of my adult life I struggled with payments. When I turned 62, which was 14 years ago, I decided that for just one day I did not want to owe anyone anything. I wanted to feel what it was like to be in that position. With growth came competition. There were, and still are, plenty of challengers for the block of business Life Data Labs has acquired. Today, Life Data Labs sits on a 10 acre property that houses an ever growing manufacturing and warehouse area. It is as streamlined as one could imagine and the entire complex is operated by just 13 employees. Several years ago it received the coveted ISO 9001 certification which is recognized worldwide as a mark of excellence. Only 10 per cent of all manufacturers in the United States have this certification. Gravlee is quick to credit his wife Linda with being a steady hand in guiding the company’s direction. Perhaps the most interesting aspect of Life Data Labs is that it remains virtually a one product company and in the ownership of its creator. “I’m very proud of the fact that we were able to create a high tech product in a very niche market and have it grow to this size. History has shown that dreamers with original ideas seldom ever benefit from those ideas. Sooner or later inventors who do not have the skills to manage a business end up losing their ideas or selling them to someone else. I suppose I have the banks to thank for my situation in not being willing to lend me any money so I had to pull it up by the bootstraps. Six years ago the firm made a big investment when it decided to buy a vacuum packing machine and follow the coffee industry effort of providing product as fresh as possible. How is it though that the company was never sold to a larger entity? Life Data Labs appears to have an intimate relationship with its employees, which is another oddity in today’s world. “The staff is like an extended family. We have a multi-million dollar facility here but the truth is that our greatest assets walk out the door at 4:30 and come back the next morning. Everything else is just a pile of scrap metal,” says Frank noting that Linda’s 87 year-old mother continues to work in the plant. Farrier’s Formula has achieved worldwide distribution but Frank maintains a particular fondness for Canada. If Dr. Gravlee sounds a bit evangelical in the promotion of his supplement, he is. No one could be more enthusiastic about the benefits of Farrier’s Formula and he makes every effort to educate his customers to that fact. “Education is such a part of what we have to do. The truth is veterinarians receive very little education on nutrition; their craft is more predicated on dealing with crisis situations. Some try to wing it on the subject of nutrition but at the end of the day they really don’t know. Frank and Linda have also become involved in Thoroughbred ownership with 15 head. It allows him to keep a handle on the racing industry’s needs and remain exposed to its biases. He points to the fact that so many are quick to accept products that use descriptions like natural, organic and herbal without any data to back up their claims. They also tend to be trendy and quick to jump on fads. There can be no debate that Dr. Frank Gravlee maintains an ongoing curiosity for the plight of horses and their nutritional needs. It’s doubtful that will ever stop. He’s rightfully proud of what he has achieved but in no shape or fashion sees an end in sight. He admits he derives a great deal of satisfaction from proving the bankers wrong. That’s a long way from the tub and canoe paddle days.